Ford Transit MK7 exhaust system these are parts like exhaust manifold and egr cooler. 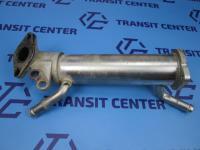 Ford Transit MK7 exhaust system these are parts like exhaust manifold and egr cooler. If you are interested in to buy for instance, the muffler hanger with rubber or the exhaust manifold, you should visit our website. Less than half a year on the market, the seventh generation received a prestigious title ‘Van of the Year’! Nothing weird, because compared with the predecessor were made the great and revolutionary changes. There were shown the wide range of engines, the enormous possibilities of arrangement and selection of body variants with capacities from 1,010 to even 1,638 kilograms. What is more, in 2009 Ford Transit has been renovated with, inter alia, the new engines, eg. 5-cylinder 3.2 diesel 200 HP. Although the car is quite young, it is worth to remember about a regular servicing. This guarantees, that the exhaust system will be effective and efficient. With our offer in mind, we own a.o. the muffler hanger with rubber and exhaust manifold or the exhaust gas recirculation cooler. If some searching product is temporary missing, please contact with us by e-mail to make an individual order. The shipping cost depends on the size of commodity.